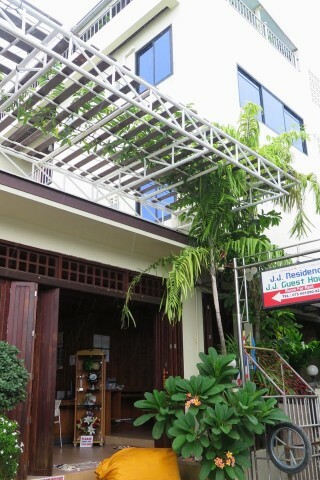 The classiest of the JJ properties, JJ Residence is one of the growing number of clean and well-maintained mini-hotels in the centre of Ton Sai village, located just beside the post office and a very short walk to the beach on one side and pier on the other. Ad Book now! Rates from US$42.18++. Average rating 7.7 from 1,382 reviews. The Residence itself is a multi-storey building that backs onto the swimming pool-- not the most tempting pool we’ve seen considering Lo Dalam is minutes away, but we imagine it will swing the deal for some. Rooms are well sized, if sparsely furnished, and very clean. For the money, for Phi Phi, if you want a hotel room, this isn’t bad value. Best to book in person or through an online booking agency since no one replied to our emails and our calls were forwarded to a fax machine. The staff on site are friendly and clued up, however.